Here in my part of Dallas, Texas the soil is hard clay and no matter how much soil preparation we tried our vegetable garden always failed. Between the soil, all-too-frequent storms, and pests of one type or another our garden vegetables always succumbed before harvest. We had given up on growing vegetables for good, we thought. That is until we found upside-down gardening. I bought 3 Topsy-Turvy hanging planters at the `Home Depot` and put a zucchini(courgette) in one, tomato in another and bell pepper in the third. The zucchini was my first success at growing from seed (we gave up on outdoor propagation and set aside a table in front of a south-facing window). I didn't think the zucchini would make it out of that table as I had forgotten to water it for a couple of days and it dried out and almost died. But it pulled through and came back just before transplanting. 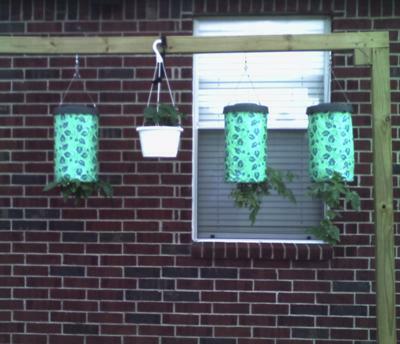 The Topsy-Turvy planters are hanging from a 2x4 braced wood frame I built - it's not the prettiest but it does the job. I used a piece of 8 1/2" x 11" computer paper rolled around the delicate leaves of each vegetable plant before pushing the leaves and stem out through the hole at the bottom of the Topsy-Turvy. I held the planter "upside down" so for a minute it was a right-side-up planter :) Then, still holding the plant in place I carefully fitted the foam plug around the stem of the plant. This both holds the plant in place and holds in enough water for proper growth. Next, I placed scoops of potting soil (Miracle Grow potting soil from the local Home Depot) into the bottom of the planter until the vegetable roots were completely covered, being careful not to leave any voids and being careful not to damage the roots. Then I filled the Topsy-Turvy with the potting soil up to about 2 inches from the top of the planter. After fitting the "cap" onto the planter I hung up the Topsy-Turvy to a hook I had inserted into my wood frame. Over the next 3 weeks I watered each morning. One mason jar to each planter worked out to be the right amount. I saw no growth for at least a week but by the end of the second week I started to notice good growth on all 3 plants in their vegetable containers. At about 3 weeks the plants seemed to stop growing until I added some Miracle Grow plant food. The Topsy-Turvy vegetable planters have performed wonderfully and the plants have exploded in leafy growth. I am especially happy that there is NO WEEDING to be done. It has now been over a month and the zucchini has flowers and buds (which makes me proud). The tomato - growing bigger and leafier and the bell pepper has numerous buds on it. I am not a vegetable garden expert and am not sure if those buds are the fruit or will eventually open up to form a flower. I am excited to find out, actually. There are about 5 buds on the pepper, maybe 3 or 4 small yellow flowers on the zucchini. Three of the buds on the pepper look like fruit, one of which is the size of my fingernail, and one white flower just opening this morning. Now on to the next adventure, I'll tell you later about growing lettuce and spinach, more tomatoes and a surprising sweet potato sprouting. This is the first time I have purchased a topsy turvy tomatoe planter. I filled it with organic soil which had already been treated with miracle grow; I than added one heirloom tomatoe plant I purchased; and I one time added more soil to it. I use the miracle grow plant food every two weeks and water it. It really needs to be watered daily in the semi-arid climate of Wyoming. I missed almost two days of watering it; as we had cooler weather for 2 days; and I noticed the leaves starting to wilt and some leaves turning yellow. The cooler weather also could of gotten to it; as it was 40(f) degrees for the low a couple of days ago. With the strong sunlight and 90(f) degrees temperatures for a week and a half, it was really growing quickly! I have two tomatoes on it, one red. I also have 4 to 6 flowers on it. I am hoping the warm weather stays through October at at least. Ok, so it sounds like I messed up. I've never used the Topsy Turvy planter before. I made the mistake of planting tomato seeds in the planters instead of seedlings. After reading a bunch, I just realized that a seedling is not the same as a seed. Duh. I feel really dumb. I planted herbs in the side holes of the TT planter. I thought I was doing something smart. Well, I realized now that I messed up. So, now what? Will the tomato seeds produce seedling in the TT? Do I have to start all over? I'm embarrassed and frustrated,but I really want to get this right. Thank you all for your comments and ideas! I just wanted to post an update on the Topsy Turvy garden. Today is December 1st and we've had two days of frost here in Dallas so far with more on the way this week so I doubt it'll survive much longer. We had a hot, hot summer and fall and I didn't realize just how much water these things need on a hot day. After the hottest days passed, production went way up. I made all the worst mistakes - overwatering, underwatering, not protecting them from the sun at all, not regularly adding Miracle Grow nutrients, not protecting from bugs, not pulling off the dead leaves. All in all I am happy with the Topsy Turvy planters but plan on making my own next year for the larger plants like tomatoes and peppers as I've learned that they really should have a 5 gallon container for full growth. Here is a summary of what I learned and some ideas I'm tossing around for next year. 1. Try to choose two or three different varieties of each veggie where possible; early, mid, and late varieties. This will ensure you have harvests over a longer time. 2. Check the soil in the planter and touch the sponge at the bottom a couple times a day to make sure you're giving your plants the right amount of water. Do not let the soil get too dry or too wet. Check out each plant on the web for its water preferences, some like to stay wet while others prefer to dry out a bit before watering again. 4. Believe it or not, insects were still a problem this summer. I thought that because they were 4 feet off the ground the insects couldn't get up there. I forgot about grasshoppers and caterpillars! Ouch! Next time I'll drape the plants loosely with insect screen fabric and make it big enough to allow for copious plant growth. 5. Use the right size container! I put one of my Tomatoes in a gallon size container and it produced smaller fruit and not even half what the other plants did. Tomato, pepper, zucchini, and melons all need a larger container while carrots need a deep container but not necessarily that large. Lettuce can grow in a dixie cup probably if you water it enough and bathe the roots in a liquid nutrient solution. 6. Check out the web for companion plants. I had broccoli growing right next to one of my tomatoes and never knew that the two hate each other! Also, garlic, mint, french marigolds, and many other plants repel many insects. I am happy that I found your informative note on how to use them. I bought 3 Topsy Turvy planters at Home Depot and planted tomatoes(Big Boys) and have beautiful tomatoes on them - they have not yet turned red. I also planted green peppers, my family have already eaten 3 peppers and more to come from a lot of blooms on the plant. In the 3rd one I planted cucumbers and have eaten 3 off of that plant and more to come... I put a mix of potting soil and top soil and just started to put Miracle Grow in them. My plants are doing wonderfully and will plant again next year with a few more. I have tried tomatoes, peppers, at least 6 plants and they never have produced any fruit. I get a long stem with a few leaves and then they just die. I have checked the moisture and am sure they are not over watered or dry. How do you get them to work? Two years in row the cherry tomatoes did so so... rest not good at all. Tomatoes do not like there leaves getting too wet, grown this way they get wet. Most rot at the bottom and the stem coming out of hole has bumps all over it... so no luck here. Put lime spray, blossom spray. I feed and water... just failure - any sugestions? Arkansas hot humid, zone 7. Try to find a local drywall contractor and see if they will give you some of the empty joint compound pails(with covers). What you would do next is pretty much a no-brainer!! My husband has wanted some so now our daughters and granddaughters will have fun making them this week out of the extra plant containers I planned on trashing tomorrow. RECYCLE RECYCLE RECYCLE keep you posted. We own 2 Topsey Turveys because my husband had to have them... but I told him I wasn't going to buy more than 2. So we came up with an idea and we made our own upside down hanging planters out of hanging baskets. We just cut a circle and put styrafoam that I cut a slit in, placed the plants in the vegetable container and added the potting soil. The tomato plants and bell pepper plants in our homemade baskets are doing so much better. The tomatoes planted in the Topsey Turveys are dying off. These vegetable plants had blossoms and small tomatoes already on them when we purchased them but the plants are dying and the tomatoes are drying up. My mother in law had one and the Arizona heat made it fall apart... it rotted. by: Shel from Biloxi, MS.
My neighbor gave me the idea because, like many, I can't afford to buy the original version. I just cut out a hole in the bottom and placed a small piece of old cloth at the bottom were the stalk hangs out. It works just the same but the only exception is that it's a little heavier. My tomatoes are very abundant. My hubby and I are thinking about making a bunch of buckets, painting them with different ideas or request ideas and then selling them at the local flea market. This is one of the best inventions yet. Wow! Janet, never thought of using a soda bottle. As I said, I used a large plastic hanging planter when I lived in an apartment now I have a small garden in the back yard. I put a patio (cherry) tomato plant in my hanger, wrapped the roots in cling-wrap, put them in through the bottom and it is looking great. It already had 3 cherry tomatoes on it when I planted it. Thank you for such a interesting and helpful site. I have had great success with the topsy turvy planters in the past. This year, I have over a dozen of them and have only lost 1 pepper plant. A couple things to keep in mind with these planters..
1. They tend to dry out very quickly. If it's hot where you are, water daily and heavily. 2. If you see any yellowing leaves, remove them quickly. Because the plants are upside down, blight spreads quickly. Good luck with your garden!! Can't wait to read more and see more photo's. Don't have to spend money on Topsy Turvy containers when you can just buy a hanging pot for less, cut a hole in the bottom and then add your vegetable plant. On top of the hanging vegetable plant put in herbs or marigolds. They do a wonderful job those hangers. Just watch your weights as they get heavy and you need to be able to water them all the time. I to was interested in the Topsy Turvy planter. But didn't want to pay that much for a vegetable planter that I didn't know if it really worked. So I got to thinking why not do the same thing in something else without paying all that money out for something that might fail. I took a 3 liter pop bottle, cut the bottom off and planted a tomato plant in the neck of the bottle and wrapped some paper towel around the stem then filled it with Miracle Grow potting mix. It's working great. So if you're like me and like to recycle or can't afford to buy every new thing that comes out, try what's around you - a water pail, large pop bottle... use your imagination. I thank you for your helpful article. I have been debating on buying the Topsy Turvey and after seeing how happy you are with it I will be ordering soon. I wonder if the plants can hold up through cold weather. My tomato plants froze last year after an early frost. I'm happy to say I have flowers on my tomato plant. It has been about 3 weeks. Thank you for the tip on giving it Miracle Grow food. I will try that. I'm going to try growing cucumbers and peppers also. The only thing about Topsy Turvy is the foam part where the plant grows out of - I think it's too tight. The tomato stem looks scratched - like it's having a hard time growing through the foam. Next time I'm going to make the cut bigger. I hope I start getting tomatoes soon. I have been wanting to try the Topsy-Turvy but my husband keeps saying it's a waste of time. I am saving your story. He used to live in Texas... he might accept your story. So Much Potential Tommy... Great! It takes a Texan (or someone in Texas) to come up with the good ones. Seriously though this type of growing has so much potential. Where we might struggle for space or, like you Tommy, have problem soil then going `up` and using the space that is all around us like this literally opens up a whole new dimension. I look forward to your updates Tommy and thanks for sharing.